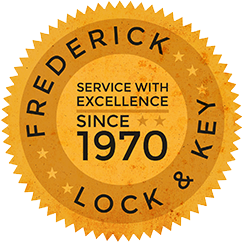 Since 1970, Frederick Lock & Key Inc. has been providing Central Pennsylvania with expert automotive, residential, commercial, and industrial locksmith services and professional security product advice. People unsure about who to contact when they’re locked out, or those who need help selecting and installing security hardware can rest easy knowing that we incorporate value, quality, and honesty in every project large or small. You can trust the security of your family, your home, and your valuables with us. We know that if you’re locked out or installing security hardware, you need a trusted professional. We’re neighborhood locksmiths with a brick and mortar business located in Altoona, PA. Our extensive work with previous clients not only means safe and reliable service for you, but also significant savings. You won’t pay for services you don’t need. Other inexperienced or out of town lock services may try convince you to remove and replace your security hardware as a quick solution if you’re locked out somewhere. But that can be incredibly expensive. However, as our neighbor, your concerns are our priority, and we’ll always work to fix or repair before we replace anything, which saves you money. Dear Frederick Lock and Key, I wanted to thank you so much for helping me today! It was so kind of you to rearrange your schedule to make my day easier since I had an hour drive to get home. The two gentlemen that came to change the 4 locks were so professional and kind! My Dad’s house was broken in to and your company made a bad situation seem not so bad! Thank you! I am super impressed with your kindness and promptness. Thank you! Frederick Lock & Key made my day. I came out of the office the other week, and it was just nasty cold. And my keys were locked inside my car. I was frustrated. I was mad. I called Frederick Lock & Key, and I talked to Mickie. She calmed me down, and sent out one of their vans. The guy who showed up was really professional. He got my car opened up quick. I got my keys. Got my car running. Got my heat cranked up. A pretty good end to a really bad night. Thanks guys! With 3 fully-equipped service vehicles, we can bring service to your home or business anytime day or night.